Equine Touch Foundation has developed a learning system offering a study program on two training routes. The first is designed for the Dog Owner, whose desire is to work only on their own pets, the second “route” is for professionals who wants to become a CT Practitioners©. 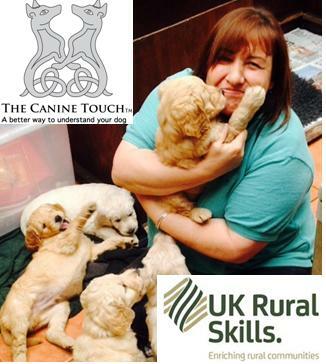 Canine Touch study is divided into Practical Levels (Level 1 and Level 2) and Theory Modules (Module 1 and 2). Practical classes are taught in class situations, where students learn the moves and procedures and are able to practice on their dogs under the supervision of CT instructors. Our CT classes are kept small, so each student can have the personal attention from an Instructor allowing them to absorb as much information as possible and learn the technique according to individual needs. On Level 1 students receive MVDr Ivana Ruddock’s book ‘The Canine Touch A better way to Understand your Dog’ and a comprehensive practical manual at each Level. If they wish to have more “at home” support they can purchase a DVD. A few years ago I was planning to train in equine sports massage to help ease muscle tension and aid relaxation in our horses after work or if injured. My young horse was mischievous and I kept finding her in places she should not be and with an injury I wished she did not have… I wanted to have something at my fingertips that was useful to them. Then I read an article on Equine Touch and felt more drawn to it than massage so booked onto a course. I really did not know if I was wasting my money, I did not know anyone who did it and nobody knew anything about it. My course instructors were Sophie Ritchie and Emma Overend, and after the first day I was hooked. I came home on the final day and tried out this new technique that I had learned on one of our horses Remedy who held onto a lot of stress and tension. My husband and I were amazed as Remedy melted, softened, relaxed and let go as I worked on her. From here Equine Touch, Canine Touch and VHT has become part of our daily lives. So it was not long before I had to share this wonderful technique with my friends, vets and dog lovers. As nobody had heard of it in our area I decided to see if there would be any interest in a Canine Touch course. There was great enthusiasm for it, our local yoga teacher Marilyn offered her house for our venue, our local vet’s wife Sue and one of their vets Jill booked on, there was Janet a dog behaviourist, Marj who helps at the Rescue centre, dog lovers Rosemary, Janice, myself and my daughter Emma was our chief assistant for the two days. We had the wonderful Emma Overend and her three very skilful assistants, Terrier, Bert and Bear instructing us for the two days. As the course date got closer I began to worry, eight people, eight dogs and Marilyn’s lovely home, but it all worked out well. At one point there was this tranquil, peaceful, quiet energy as the dogs lay flat out on their cushions as we worked on them. I have had fantastic results with my 14 year old Jack Russell, Nipper. She had a cruciate ligament operation many years ago and had stiffened up quite badly. She now has much improved freedom of movement and the ultimate proof was when she began jumping in and out of the wheelbarrow. Not only have we seen such benefits to her mobility but she has also lost weight and asks for CT for relaxation. I help those of the group who want to get together and practice on each other improving their understanding and technique. 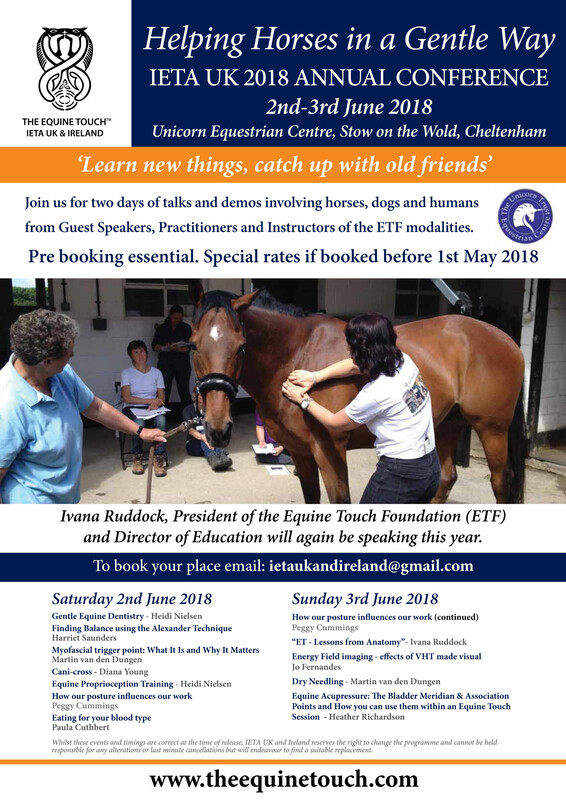 For me the course made me realise just how powerful VHT, Canine or Equine Touch is when the intent and integrity comes from a loving honest heart that wants only to help, horse, human or dog move forward and out of physical or emotional pain and discomfort. Anything is possible if we listen then respond and pour love into it. I have found great inspiration from Ivana and the instructors Emma, Chris and Lyn. VHT, Equine and Canine Touch have influenced new direction with my work and have crept into all corners of my life. I regularly see horses in pain and discomfort and their signals for help are misunderstood or ignored. My aim, for our local area, is to bring this technique to as many people as possible. I feel it has an important part to play in the welfare of our animals. As humans we have the choice to go out and seek help if we are suffering from pain or pain related problems but animals cannot. I believe that if I can encourage horse and dog owners to experience or observe the positive effects of this amazing bodywork that they too will learn this technique for themselves, and much of the unnecessary pain and discomfort in our animals will be dramatically reduced. I also feel that learning this technique increases our observational skills, connection and awareness of an animal’s body language. Thus improving our ability to read the signals the animal gives us and being able to respond in the best way possible. For anybody thinking about running a course in their local area, I would highly recommend for them to do so. It may be a daunting thought but once you have an instructor, all you need is a venue, enthusiastic students (and canines) and it will all come together on the day!